The 3rd Annual Filmshift Festival is coming to the Somerville Theater this October 6th, 7th, 13th, and 14th. Filmshift was created by independent filmmaker, Jeremy Jed Hammel, as a way to combine three of his passions: The art of film, bringing people together, and giving back to charity in his local community. 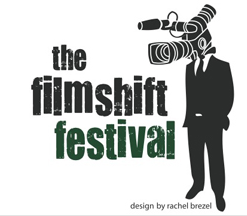 Filmshift presents independent films of most genres and has special Showcases for local Boston or New England films, student films, and films that have a connection to Environmental or Sustainable topics. Some films that Filmshift has presented in the past include “Earthwork,” starring Academy-Award nominee, John Hawkes (for “Winter’s Bone,”) Comic Con 2010 winner, “Marwencol,” and “The Burning Season,” narrated by Hugh Jackman. Filmshift offers cash prizes of $1250, awards from industry leaders such as Final Draft professional screenwriting software, Script Pipeline, Improv Boston, Cambridge Naturals, as well as superlative awards to their filmmakers. Ten percent of Filmshift’s gross ticket sales are donated to Christopher’s Haven, a local Boston charity that finds low-cost or no-cost housing for families staying in Boston for their child’s cancer treatment. 0 Response to "3rd Annual Filmshift Festival - Starts 10/6"